Taking an active role in managing your asthma. Asking the right questions to the right people, and making sure you understand the answers you are given before making decisions about your care. Working with your Healthcare Professionals to help you set your goals and then meet them. Understanding your rights and responsibilities as a patient. Telling your family, friends, boss, co-workers and others what they can do to help you manage your asthma. Knowledge is power in self-advocacy. Understanding the words that your Healthcare Professionals use will help you become more comfortable asking questions. If you don’t understand something, ask! 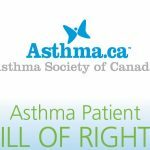 You should ask questions to make sure you understand exactly what choices you have as you manage your asthma.